amanda mcclements & metrocurean: Pho: A Street Food Crossover Hit? Pho: A Street Food Crossover Hit? 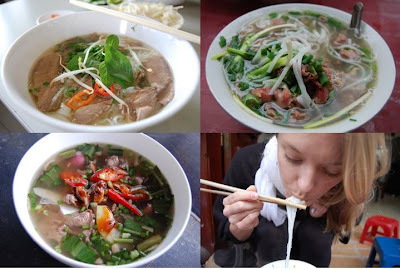 Me and my adventures in pho in Saigon, Hanoi and Hoi An, Vietnam. Two years later, I headed to Vietnam and had the chance to eat the native soup on its home turf. Pho bo (beef) was breakfast most mornings during our two-week stay in the country in December. If my husband and I didn't get a morning fix, we'd go hunting for afternoon soup. My love affair was sealed. Back in the States, international foods traditionally served from stalls or carts have been coming in off the streets and getting gussied up in restaurants. And I think pho is about to have its crossover moment. A few weeks ago at the upscale PS 7's, while being treated to Gina Chersevani's seven-course cocktail and food pairing menu (details here), chef Peter Smith presented a small dish of duck pho to pair with Gina's spin on a shandy made with Miller High Life. A fun pairing and a fun twist with the tender duck subbing in for beef or chicken. And just last night at Bar Pilar, I spied a bottle of Sriracha on a table. Come to find out, chef Justin Bittner was serving up a special of pho, so I of course ordered some (with my fried chicken and biscuit). The broth was dark, flavorful and perfumed with spice, and the dish would hold its own against the best versions I had in Vietnam. I say the more places to find good pho the better. Thoughts? I would have never associated Pho with bar Pillar ;-) Good to know. I must try it soon. What makes PHO PHO? At some point it is just Asian inspired noodle soup right? PHO is great for the taste, the condiments, and the slurpability. To me, that gets lost when you are eating in a nice(er) restaraunt. While I don't mind PHO springing up in more forms in more places, I am not sure if I will be ordering it. I guess you can call me an unofficial Pho ambassador. I consider it my duty to drag as many friends as possible to local Pho spots just to see the looks on their faces when the heat kicks in and they realize they really REALLY like it! That being said, I don't think I would feel comfortable making that introduction somewhere like Bar Pilar... half the fun is taking them to a relative dive; somewhere they would never enter on their own. Also, sucking in the overwhelmingly delicious smell of Pho broth makes the wait for your own bowl all the more enjoyable. If that smell was tainted by the scent of Pilar's duck confit or friend octopus, the experience just wouldn't be the same. Evan - Sometimes I wish I worked in NoVa for that exact reason! FrenchTwist - It was a special so maybe give them a ring to see if they have it before you go. But on a night I don't make it to a more authentic place, I'm pleasantly surprised to be able to get those flavors at one of my favorite neighborhood spots. @MDuncan - I couldn't agree more. I have brought many coworkers into the Pho world and i wouldn't want to get it somewhere fancy, it's something meant to be eating at a dive place like you say. @Amanda - yea, nova is great, i try and spread my pho driving range a little further each time. Hai Duong at the Eden Center is the best pho in the area. I miss good west coast Pho, but no tripe or any that fancy stuff. Proof had pho pate on the charcuterie plate during the snow which was amazing. I think homemade chicken pho is the best (they sell the spice packets at the asian market). Being a Vietnamese person that grew up in the area, I am a fan of Pho 75 (the one near 7 corners is my favorite). I just wish they wouldn't use so much msg. I hope more pho spots open up in the city. I am more excited to try Pho Viet on 14th street than I am to try it at Bar Pilar. Don't worry, I will try both.